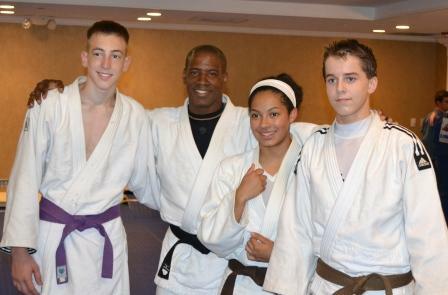 Rick Joseph reports that the USJF’s BC Dage Corporation Travel Scholarship and MJDA funding dollars were well spent as Konan brought home 7 national medals between the 4 judokas, who were funded. Daniela Gomez took a Bronze on the International day of the Junior Olympics in IJF down in Irving, TX. Gabriela Gomez who fights in Juvenile B captured a Bronze at the USA Judo Junior Olympics National Championship, a Silver at the JO Internationals and a Bronze at the U.S. Junior Open Judo Championships in Fort Lauderdale. Nick Joseph won a Bronze medal at all three events. This consistent performance by Nick secures his # 2 national ranking for 2012 in the Juvenile A 58 kg. division. Gabriela and Daniela are also highly ranked on the elite national roster within their respective divisions. This entry was posted on August 4, 2012 at 8:30 am and is filed under Judo Tournaments, Results. You can follow any responses to this entry through the RSS 2.0 feed. You can leave a response, or trackback from your own site.